MobileDJ™ is a remote control jukebox system. 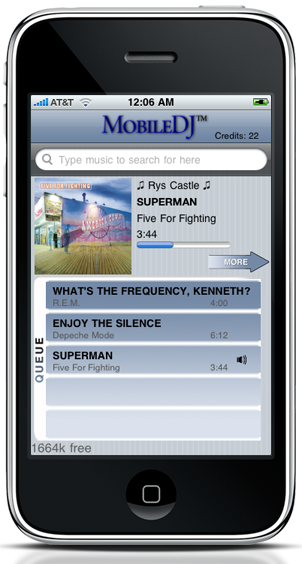 Customers select and pay for songs to play via their iPhone, iPod, iPad or Android device. Listen to your favorite tunes at your local MobileDJ™-enabled coffee shop, bar or restaurant. Browse, select & queue songs via your mobile device. MobileDJ™ is so easy to use. Just download it from the iPhone App Store or Android Marketplace; search, browse & select your favorite tunes. Interested in MobileDJ™ at your venue? Let's chat over coffee. We'd be happy to give you a demo. © 2009 MobileDJ™. All rights reserved. All product and company names referenced herein are trademarks of their respective owners.